Shopping. We (or rather, I) managed to do most of our Christmas shopping in Córdoba. I managed to feel inspired by the festive lights, and stalls in Plaza de las Tendillas, and a few glasses of Montilla - the local wine (see below). Eating. We did some research before we went on our trip, and managed to locate three restaurants that all gave us what we needed: La Taberna Salinas - really enjoyable food and good wine; strange that we were allocated a table in a side room, with another English couple, but assume that was because we were couples whereas larger groups of people seemed to occupy the main restaurant. One review we read about Taberna San Miguel suggested that this characterful bar was a great place for a drink, less so for dinner, and we probably couldn’t agree more. We ordered a bottle of the Vino blanco de la casa which, in Córdoba, tends to be Montilla Fino (never call it sherry!). It came in an unmarked green bottle and this wine is normally around 15% Vol……hmm. 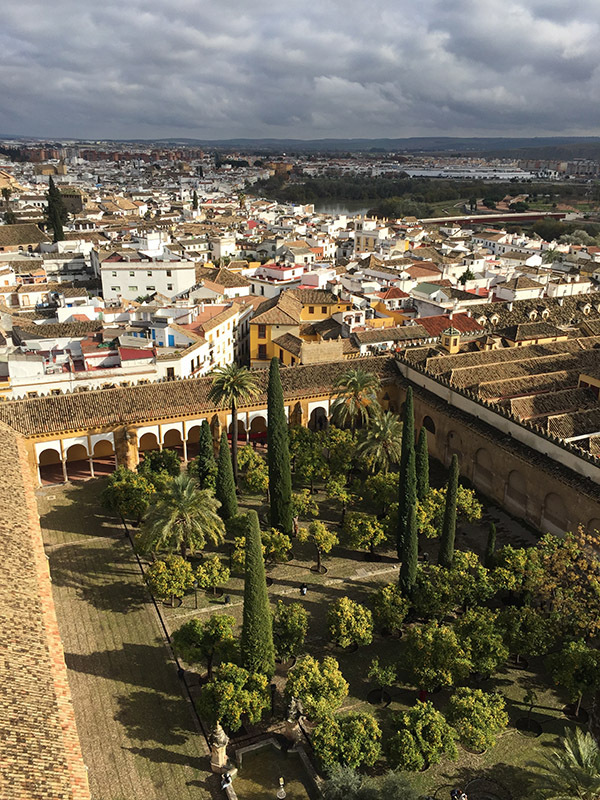 Our favourite restaurant was Bodega Mezquita, tucked away in a lane behind the Cathedral-Mosque, and we had a splendid lunch there, the highlight of which were the Berenjenas (Aubergines, fried and drizzled with a Pedro Ximenez reduction). The Bell Tower. Having written at some length about La Mezquita, I can't possibly leave out the Bell Tower. Originally, a minaret for the mosque, this part of La Mezquita was converted by the Christians into a bell tower in the mid-13th Century. For 24 years, the tower was closed to visitors, but reopened in 2014, and we climbed the 40 metres up onto the two bell platforms to get some pretty stunning views over the city. Well worth the climb and the €2 entry fee. Quirks. Andrew is going to write about Belénes but I just had to mention the figure of Baby Jesus, behind a window of a market stall, evidently frightening the other characters on his stall by both his size and his nakedness. Think ‘Gulliver’s Travels’ meets The Nativity. We also spent some time trying to find La Marcha (or nightlife) in Córdoba, and it must be extremely well hidden. We did, however, find the place where the bright young things gather for their after-work drinks - a pavilion in the middle of the park beside the Paseo de la Victoria. Strangely, we both felt that we were being looked at rather a lot by the assembled throng. We had either gate-crashed a private party or we were considered to be stunningly attractive and extremely well-attired. I prefer to think it was the latter. Flamenco. 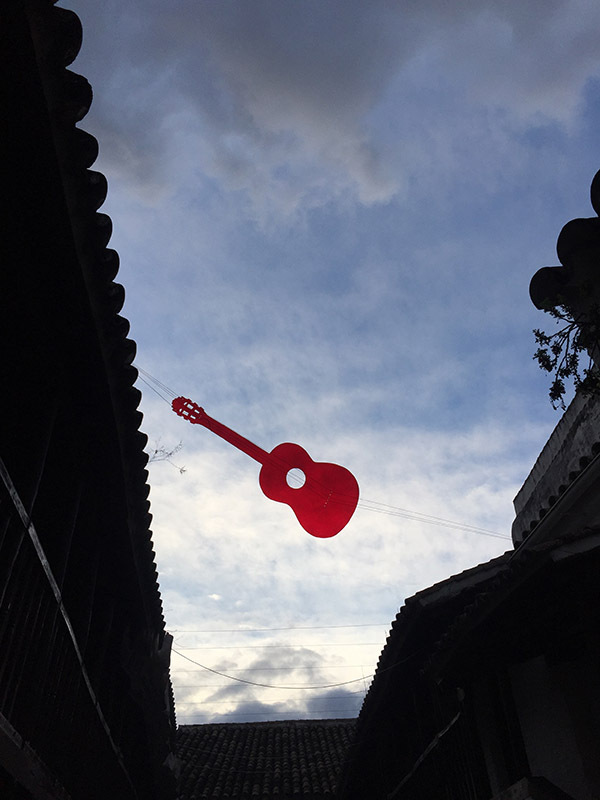 We visited the Centro Flamenco Fosforito in the Posada del Potro, a free-to-enter museum dedicated to the great Flamenco singer Antonio Fernández Díaz, known as ‘Fosforito’, and the art of Flamenco. This was a lovely space, and there are regular outdoor performances of Flamenco although, sadly, none while we were there. However, we could practice our compás: tapping out percussive rhythm in time to the music. Clarice* was dying to make an appearance!! Montilla. In these recent posts about Córdoba, you may have seen mention of Montilla, the local wine in these here parts. Montilla is a town to the south of Córdoba where most of the Bodegas are based, so it would have been rude not to have taken a quick detour on our journey home. The trouble was that, when we arrived in the town, we could not find a bodega for love nor money! Having driven around and out of the main centre we had almost resigned ourselves to an empty boot, but Lo! A bodega! We stopped and trotted to the courtyard to find several chaps clearly enjoying a few samples over lunch and when asked if we could try the local wine, they directed us to a branch of Coviran over the road! Disconsolate, we gave up....but Lo! again, we did find a bodega, with a shop, had a rapid sample and bought 5 bottles. Of course, after that, every other building we passed was a bodega....!